Livelihood training is essential in any community, whether that be in the developed world or the developing world. Livelihood training links technical and further education and training with the development of skills and experience used in the workplace or to enhance the livelihood and therefore the viability of subsistence communities. The WithOnePlanet livelihood program has a focus on three elements agroforestry, permaculture and Information and communication technology. These three elements produce skills required for survival and then advancement in the 21st Century. Agroforestry is the integration of trees and shrubs into farming landscapes for conservation and profit. It’s all about farmers using trees to improve the environmental, social and economic values of their land. Permaculture generally is the design of sustainable communities. This includes organic agriculture, housing, animal husbandry, forestry, waste management, environmental care and more, and is specific to each environment and population where it is implemented. Information and communication technology is imbedded in most daily activities in the developed world and technological advancement means that the developing world can adopt and adapt to new technology very rapidly. Building the capacity and proficiency of the users of the technology ensures effective and efficient take up and use of new social technologies. WithOnePlanet’s livelihood skills are delivered in partnership with three organisations. The Australian Agroforestry Foundation, an Australian based organisation that created the Master Tree Growers program. The Master Tree Growers program is an intensive training course that provides participants with the skills and knowledge to maintain forestry initiatives whether that be for individual land holders or community forestry initiatives like the WithOneSeed community forestry program. The Master Tree Growers program is internationally recognised and has been delivered in a number of African countries and also in other countries in the Asia-Pacific region. Permatil, an NGO in Timor-Leste that has been delivering permaculture training across Timor Leste since 2000. Permatil, together with xpand Foundation and Disruptive Media has produced the new Tropical Permaculture Guidebook that forms the basis of WithOnePlanet’s permaculture training program. It is a comprehensive resource of permaculture design, food sovereignty and environmental regeneration strategies, for all tropical countries. 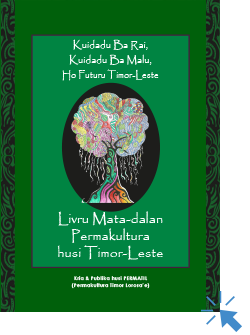 This is a rewriting and updating of a permaculture book produced in 2008 by Permatil and focused on Timor-Leste. The new guidebook will be enhanced through the use of information communication technology to enable audio and video as a method of delivery. Information technology is also used to improve delivery of the book in electronic format. Info Timor, a Timorese social enterprise with a focus on building capacity through information communication technology. WithOnePlanet, in partnership with Info Timor, is establishing Village Learning Centres to provide access to computers, the internet and other technologies that are used by students and community members in Timorese villages for educational and livelihood activities. Working in partnership with these organisations not only work to make environments sustainable, to end poverty and hunger, to build knowledge and to create regional partnerships, they also deliver skills that can be transferred within and across communities. Working with organisations that have track record in their respective fields alos ensure a quality outcome for the participants. The Permaculture Guidebook from Timor Leste was first published by Permatil in 2006, with an updated version in 2008. The book is a 400 page practical reference guide for implementing permaculture techniques that are specific to Timor Leste’s needs and specific to the tropical climate. It has been used in many countries, including Sri Lanka, Samoa, Nepal, Philippines, Solomon Islands, Uganda, Haiti Australia and Timor Leste. The new international edition is available to download at www.permacultureguidebook.org. We are currently finalising details for the English edition in print as well as commencing with other language editions, starting with Timor-Leste’s Tetum language guidebook. In the meantime you can download the original book here in Tetum. The WithOnePlanet curriculum resources to support teaching about culture and sustainability and link school communities in Australia and Timor Leste Project is supported by the Australian Government Department of Education and Training.